Worries About Health, Prejudice And Immigration Swirl At LA Clinic : Shots - Health News A South LA clinic started by Muslim doctors and students has served mostly low-income Latino and African-American patients for 20 years. Staff and patients now say they worry about their future. Dr. Cesar Barba (right), a family physician at the UMMA Community Clinic's Fremont Wellness Center in South Los Angeles, treats Lourdes Flores Valdez, 42, for her diabetes and other health issues. Lourdes Flores Valdez says she got her diabetes under control after she was able to sign up for Medi-Cal, California's version of Medicaid, under the Affordable Care Act's expanded eligibility rules. Sitting in an exam room at the UMMA Community Clinic's Fremont Wellness Center in South Los Angeles, she suddenly veers away from discussing the health law and starts talking about her husband, who is in the United States illegally. "If the president takes away my husband's job, or he deports him, what will happen?" asks Flores, who cleans houses for a living. "How am I going to take care of the children?" Clinic staff say they're hearing such worries a lot these days from their mainly Latino clientele, about a third of whom are unauthorized immigrants. Many patients are worried about losing their access to health care and about possible deportation. Dr. Cesar Barba says he's had to spend more time since the November election teaching patients coping skills to deal with stress that can affect their health. Many are on Medicaid and some are immigrants. 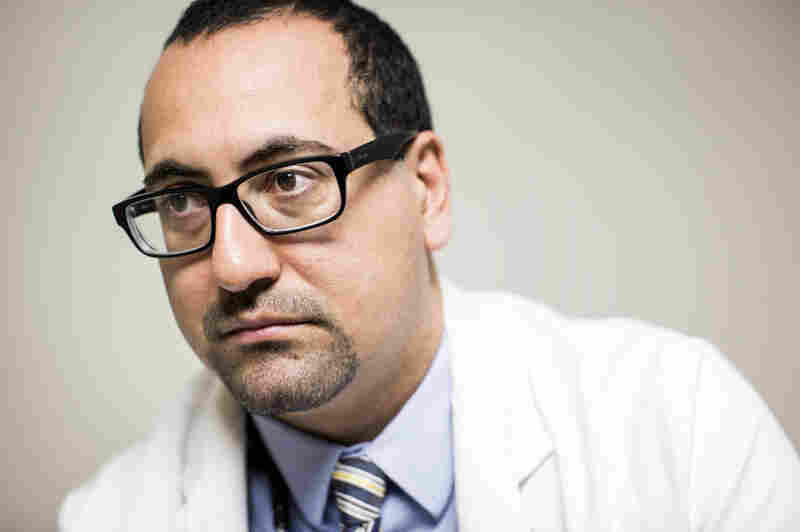 Some patients have stopped coming in, says Dr. Yousef Turshani, UMMA's chief medical officer. "They're worried that we may be a target and are concerned to even come get their health care, because there may be a raid," he says in an interview at the group's main clinic, less than two miles away from the Wellness Center. Some patients worried about losing their Medi-Cal are stockpiling medications, says Turshani. The clinic had been planning to expand its mental health services before the last election, but now that Donald Trump is president, Turshani says, the need for those services is even greater than before. The clinic has a backlog of people waiting to see a therapist. "The worry is so deep for some patients that they feel it's almost like another medical problem, because it contributes so much to their daily stress," says Dr. Cesar Barba, a family physician and UMMA provider. Turshani says despite the uncertainty in the country, he and the health staff strive to make their clinics safe places for all patients. A group of American Muslim doctors and medical students opened the clinic 20 years ago, motivated by a desire to help the community in the wake of the 1992 Rodney King riots. 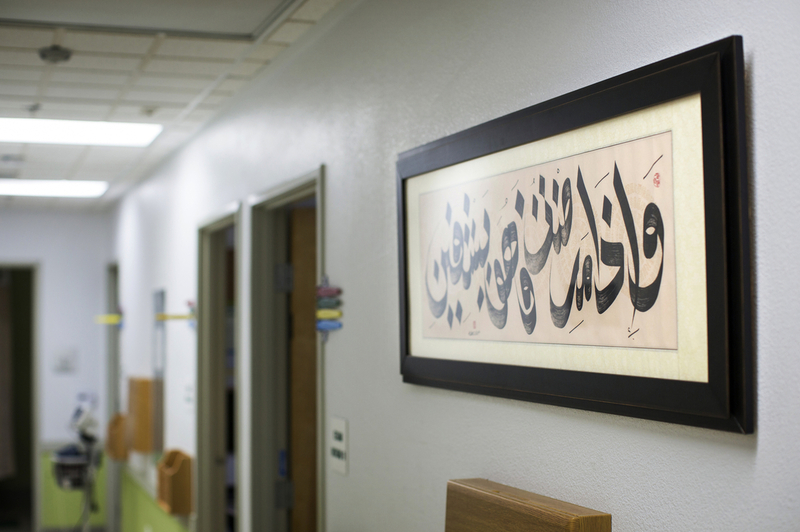 Some of the walls at UMMA's main clinic are decorated with paintings featuring Arabic scripture. Turshani translates one phrase: " 'In the name of God, most gracious, most merciful.' It's something that's placed in rooms to welcome people," he explains, "to say that this is a place where you'll be treated well." The community clinic is a nonprofit founded by Muslim Americans, the children of immigrants, to bring good health care to the poor of South Los Angeles more than 20 years ago. Today, four of the clinic's nine health care providers are Muslim. Patients need reassurance, and so do some of the doctors. Four of UMMA's nine physicians are Muslim. 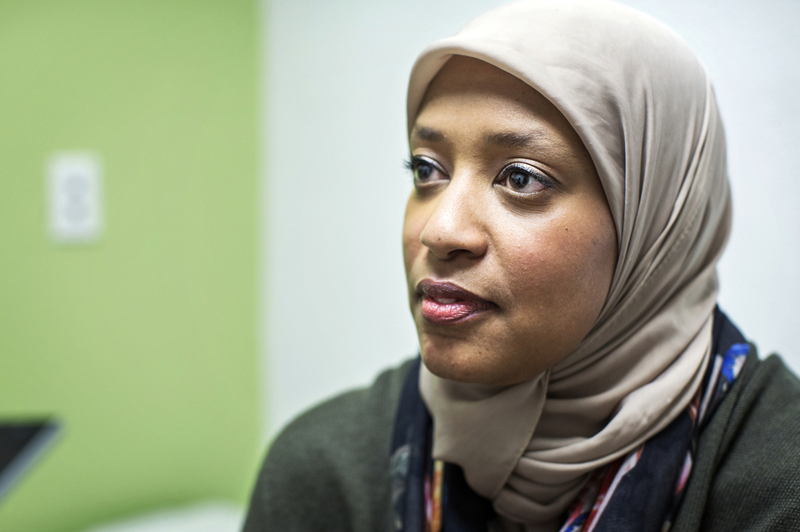 Dr. Sahar Abdelrahman, a pediatrician and the daughter of Sudanese immigrants, was born in the U.S. and raised in Madison, Wis. She says Trump's attempted travel ban was upsetting. Dr. Sahar Abdelrahman, an internist and pediatrican at the UMMA clinic, was raised in Madison, Wisc., where she also studied medicine. Her parents were Sudanese immigrants — her father has a green card — and the proposed travel ban has been upsetting, she says. "This is the only country I know," Abdelrahman says. "This is my home, and to not feel like you're welcome here — it's hard." Miriam Vega, a social psychologist and UMMA's CEO, agrees that the policy and rhetoric coming out of Washington has been stressful for the clinic's patients and staff. "We're kind of like a snow globe, or a microcosm of what's occurring at the national level," she says. Turshani says his religion provides a guide for how the clinic's physicians should juggle their patients' stress and their own anxieties. "There's actually a teaching in Islam which is, when God wants to reward someone, he puts them through a challenge," Turshani says. "There are analogous sayings — like what doesn't kill you makes you stronger." This story is part of NPR's reporting partnership with local member stations and Kaiser Health News. Rebecca Plevin is a health reporter at KPPC.